I have recently become obsessed with Middle Eastern & Persian food ......Lebanese, Turkish( ok I know Turkey is not a middle eastern but a European country ), Morrocan food! And let me not even start about the dessert and pastries they are a work of art! Flaky Baklava drenched in sugar syrup dates stuffed with almonds .....fragrant cakes soaked in orange blossom water.....so many cookies all gently dusted with magical green pistachio powder! 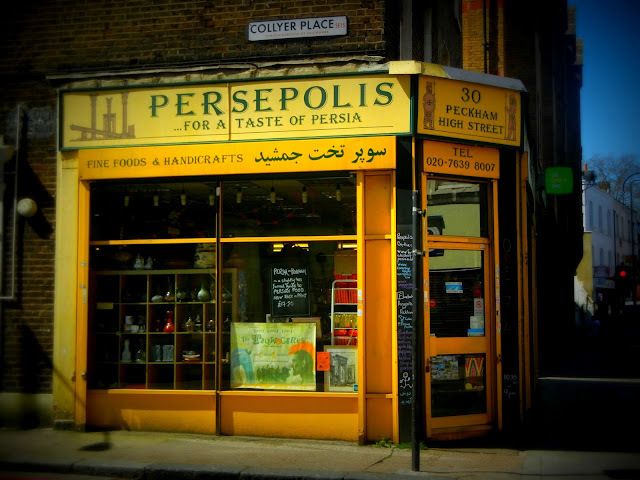 So to learn more about the food and ways of Persia I decided to visit a corner shop in London called Presipolis ...it was voted as one of Londons best shops by Time Out! The treats I came home with for the husband ...okay not really.......... all for me he dosent like anything sweet! Good for me I dont like sharing my food anyway!! Pistachio Baklava ....layer after layer of perfect flaky pastry stuffed till it bursts with pistachios and then soaked in sugar syrup.....pure genius whoever came up with this! Wow.. that is some food find. In the second pic are those kettles or just a tin for the Iranian sweets? What such an amazing loot around what did u pick up? Thanks so much for introducing me to this gorgeous store! However, it makes me miss London even more! In Cambridge/Boston, where I live, there is an Iranian film festival and I can buy the spices I need for cooking Persian dishes at an Indian store, so it is alright but could never be compared to London, with all its lectures, exhibitions, movie screenings and other events focused on Iranian topics! Very nice and informative blog Aditi! !